We were rather taken with Apple Park products at last year’s ABC Kids Expo in Las Vegas! We promised then we’d keep you updated and we now have details of the latest product ranges from this sweet little toy brand. 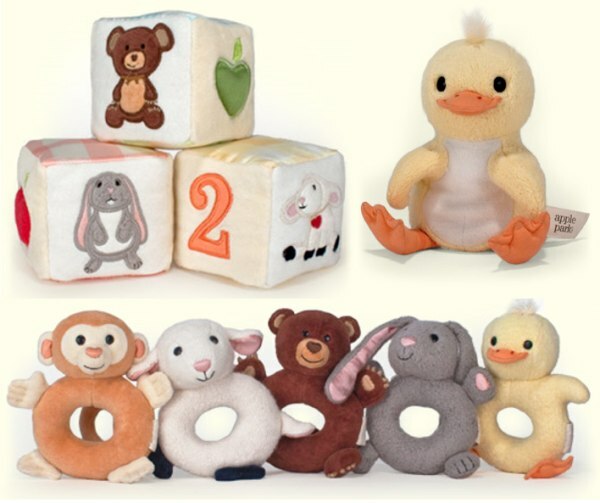 New on the Apple Park scene are cute wrist rattles, organic cloth blankies, teething softies, hand and finger puppets and soft blocks. All feature Apple Park’s adorable critters which babies will bond with in an instant. These are absolutely gorgeous newborn gifts which you’ll be proud to present in their exquisite red bags and boxes. No need to wrap these beauties! Much of the collection is available at Boombini Toys which ships internationally.